Paint the Target | Miniature armies, huge time sink. [Paint the Target] March 2014 Results! Month 3 is behind us and with it another Target down! In march the target was to paint a model with a bladed implement of death. Which pretty much meant anything that wasn’t a gun. Let see what you all came up with! [Paint the Target] February 2014 Results! So this post is a little late. March 1st happens to be on a Saturday and even though that’s the day I’m composing this results posts, it actually won’t post until March 3rd. Why? Saturdays are historically the lowest traffic days and I want to make sure as many eyeballs see your guys amazing stuff! [Paint the Target] January 2014 Results! Welcome to the first results post of the 2014 Paint the Target season! A number of you sent in your results this month (more than I was expecting in all honesty), with the target being painting a model you received over the past holidays. Coming up on the heels of the first deadline for the January Paint the Target (tomorrow! ), I’m working with Secret Weapon Miniatures to bring you guys some prize draws! I’ll have more info when the January results posts goes up, but the tentative plan is to have prize draws every quarter (March, June, September, December). So the tentative plan for the moment is that there will be four (4) drawings, one at the end of each quarter (March, June, September, December). the drawings will be random, but each painted target during that quarter grants you an entry (so paint 3 monthly targets in a quarter, you’ll have 3 entries, miss a month and you’ll have 2 entries, etc). Sorry my non-US brethren, but for the moment it’s only going to be for US folks until I get a handle on shipping and whatnot. Plarzoid has also graciously donated some very useful widgets as prize support! [Paint the Target] Reminder to get your January models in! Just a quick reminder to get your first Paint the Target models in by JANUARY 30th! We’re at the halfway mark for January! Introducing Paint the Target in 2014! Enter Now! It’s officially 2014, and that means resolutions. Many a hobbyist starts the year, bright eyed and eager to attack that backlog of projects that continuously seems to build and build until it finally consumes them and their loved ones. NAY I SAY TO THEE IN 2014! We shall fight back against the rising tide of metal and plastic! For 2014, I’d like to bring back arguably one of my favorite monthly features of the (now defunct) Lost Hemisphere blog: PAINT THE TARGET! Stop making those lofty New Year Resolutions and Paint pledges you can’t keep. Let’s take it chunk by chunk! Although my readership is mostly Warmachine/Hordes related, I’m opening this up to any game. Bring on those Infinity, Malifaux, or 40K models as well! Paint a model you received as a gift over this past holiday. Email your submissions to miniarmyhugetimesink [at] gmail [dot] com. Be sure to specify your online name so that I can credit you accordingly. Please get me submissions by January 30th. Note that this is a hard deadline – if I don’t get your submission in time, I’m sorry but it won’t be included in the post. No exceptions without bribery. Just a quick pic today again. 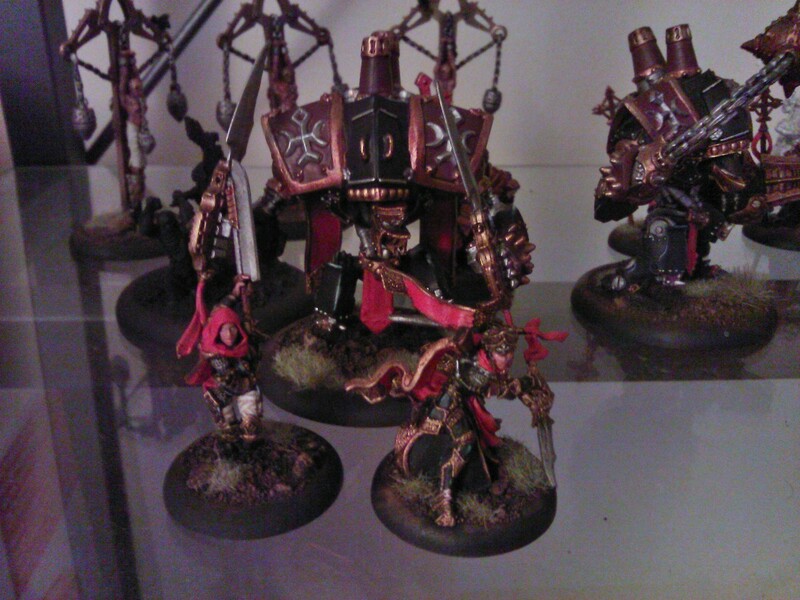 This time Thyra, her second-in-command, Nicia, and her personal warjack, Blood of Martyrs. They are going to see the table this Thursday in a 25pt T4 Thyra list. Blood of Martyrs is actually my Paint the Target for Lost Hemisphere for this month. 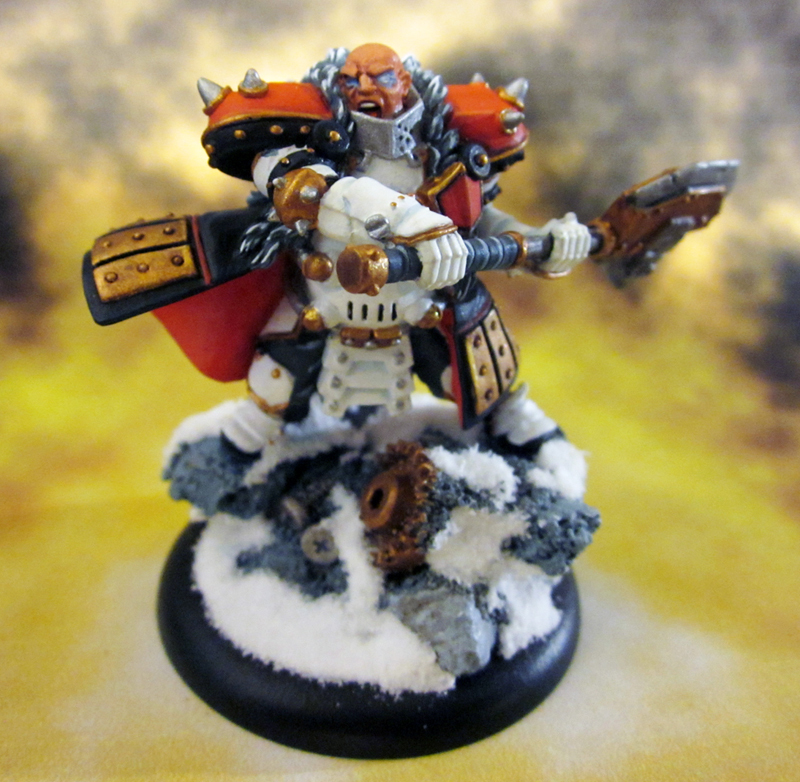 After completing him, Fire of Salvation is the only Protectorate warjack I have left to paint. This next song goes out to the warjacks in the front! 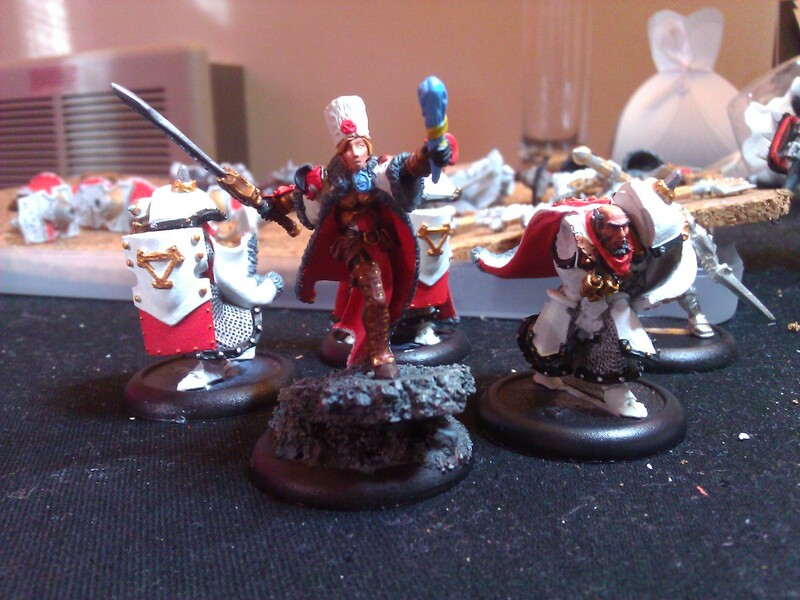 The Slow Grow/Journeyman League painting madness continues! 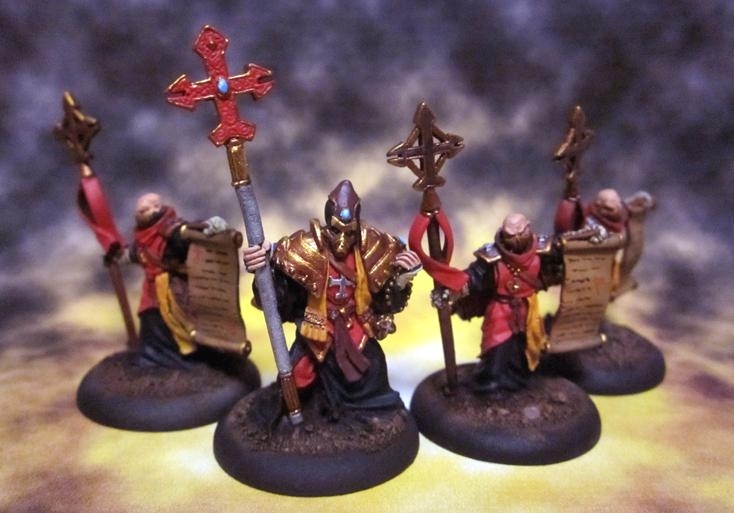 This time with, what I am sure will be a unit that sees a lot of tabletop time, the Choir of Menoth! I had a lot of fun painting these guys and they went pretty quickly as well. I especially like the leader sculpt and the way the scrolls on the grunts came out. Also, these guy’s are going to be my submission for Lost Hemisphere‘s July Paint the Target with the theme being models with Reach this month. I don’t wanna work, I just want to swing my giant axe all day! This is a little late in coming, but I’m working on getting all my completed models photographed and posted. Today we have Mr. Orsus AKA The Butcher. I’ve already mused about the man and the model before. None of that has changed. In fact, with each game I think I like him more. And I think this is one of the best models I’ve ever done! VoltRon kicks down the door with Butcher wearing possibly the cleanest armor he’s ever seen fit to don. Stormtrooper inspired? I love the high contrast between the white and the blacks and oranges. 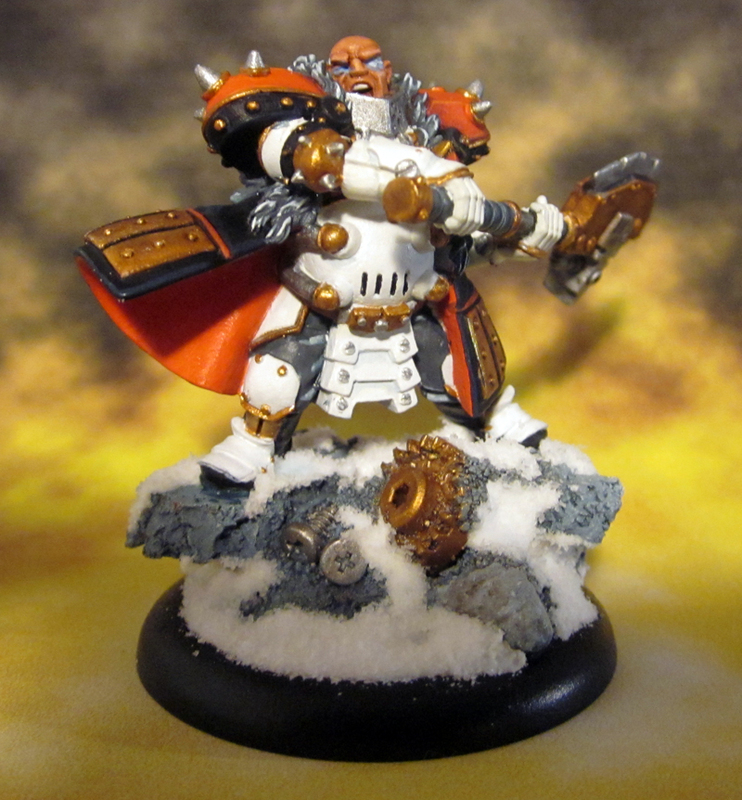 I’ve been busy: Zerkova & chipping away at the Iron Fangs! I know it seems like I’ve had a lot of random content or Work in Progress posts lately. So where are the finished model posts? Well, I have a lot of models that are done and that are just waiting for snow on their bases at this point. 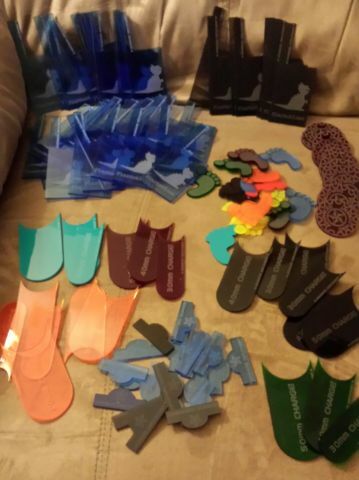 I’m waiting to seal them however and the weather has not be cooperating. I really don’t want these recent ones getting frosted, especially my latest warcasters, as I feel they are some of the best I’ve done so far.